Senate is approving changes to the English language proficiency standards and GRE requirements for admissions to the faculty of graduate and postdoctoral studies. Most of the changes to the calendar entry are updates to reflect current procedures and also to display minimum TOEFL component scores for programs where the required minimum TOEFL score is below 100. However, the proposal also changes two admissions requirements — the minimum internet-based TOEFL score from 100 to 92 for several programs in the faculty of education, and also from 100 to 90 for the master of music in piano. The TOEFL changes in the faculty of education are to standardize TOEFL requirements with the IELTS requirements, and the changes in the master of music are to standardize the TOEFL requirements with that of other master of music programs. For students required to withdraw from the faculty of arts after a failed year, Senate will be approving changes to re-admission qualifications. Replacing the old requirements, the new suggested changes will reduce and standardize the number of university-transferable credits from 30 to 21 credits. Students will still need to attain an overall GPA of 3.0 or 73 per cent on these credits, with note that there will be no time limit constraining them. The rationale behind this change is due to recognizing that students can be given a chance to re-establish themselves academically and address the causes of their failures instead of rushing into a full-term course load. Enrolment to the Vancouver campus grew to 54,232 with an increase of almost three per cent over the previous year. There has been a 12 per cent increase in the number of Aboriginal students enrolled in undergraduate programs since 2012/13, with a 10 per cent increase in enrolment to graduate programs over the same period. Note that this number is likely an underestimation, as Aboriginal students aren’t required to self-identify at any point of their studies. At 13,182 international students, there has been a nine per cent increase since last year, which is the largest international student population to date. Following China, the most common countries of citizenship were the United States of America, India, The Republic of Korea and Japan. For both Vancouver and Okanagan Campuses, female students represent a small majority of the student population. This next Senate meeting will take place on January 18, 2017 at 6 p.m. in IBLC 182 (Victoria Learning Theatre). You can read all 142 pages of the Senate docket online and, as usual, Senate is open for anyone to attend if you’re ever interested in academic affairs or meeting Santa Ono. Daphne Tse is a third-year business technology management student and the commerce and business administration student senator. Daniel Lam is a third-year atmospheric science student and a student senator at large. 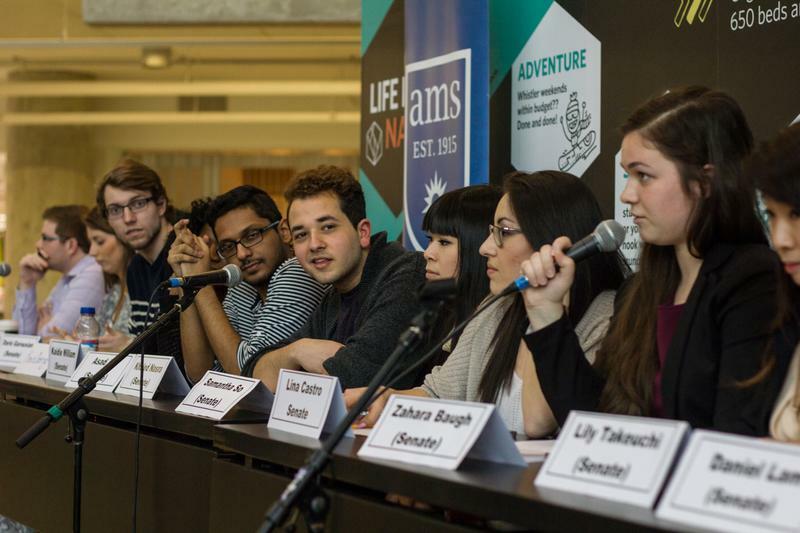 Their views expressed do not reflect those of the Student Senate Caucus or the UBC Senate.